So teaching Bible stories and concepts with simple songs just makes sense. Stephen Elkins knows this, and he’s been doing it for a long time. Elkins is the president of Wonder Workshop. He’s a songwriter, arranger, producer, and book creator, along with a team of educators, teachers, parents, musicians, artists, and designers. 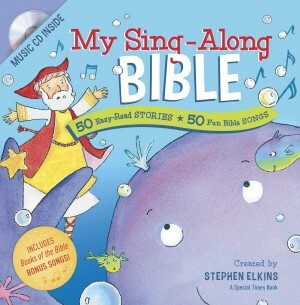 His newest music + book combo, My Sing-Along Bible, published by Tyndale Kids, is my favorite. It’s aimed at toddlers and preschoolers. Inside the front cover is a CD with 52 songs—one for each story in the book plus two bonus songs that make memorizing the books of the Bible easy and fun. Beginning in Genesis and ending in Revelation, stories are short, just five or six lines. Some retell a Bible event; others comment on the teaching of a verse. Each has a Let’s Read section, a Bible verse, a Let’s Sing section, and a Little Lesson—a short summary thought. Illustrations are sweet, colorful, and fun. The whole books is bright, cheerful, and well designed. And the songs—short and memorable. Varied styles and tempos. Memorable and easy to sing. Some are classics, most are original, many are based on a Bible verse. I chose this book for November, typically a month for thankfulness, because thankfulness is what came to mind when I found it. Thankfulness for God’s Word, for the privilege of teaching children who God is, and for the gift of music that helps us do that.